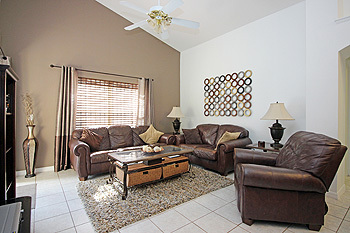 Overlooks the swimming pool and pine shrubs with patio door leading to the covered lanai. There are comfortable seats, a 46" flat screen TV, a portable cd/radio player, a selection of movies and books. A formal table which seats 6 and a bar area that includes 3 stools. 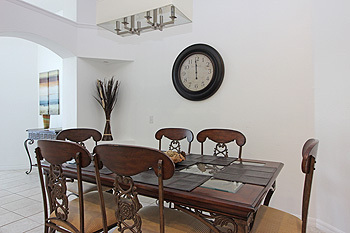 For exterior eating there is a table with 6 patio cushioned chairs situated in the covered part of the lanai, a ceiling fan keeps the heat of the day at bay so you can eat in comfort by the pool. 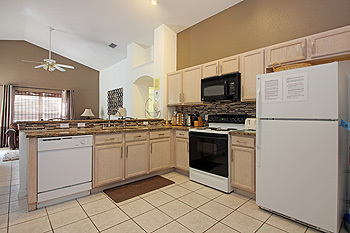 A fully equipped kitchen supplies all your vacation needs with everything from coffee maker to ice-maker. Dishwasher, large refrigerator-freezer including ice-maker, electric range cooker, microwave, double sink with disposal. 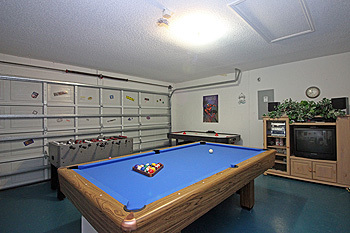 A utility room equipped with frontal loading washer and dryer is situated off the kitchen door through the game room. There is a clothesline in the game room. We also provide an iron and ironing board. 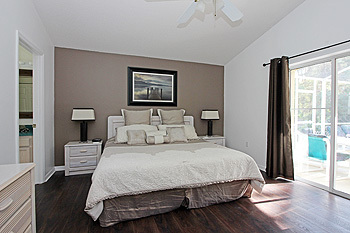 The front master has a king-sized bed, a 21" TV with CD player, radio alarm clock and a ceiling fan. The en-suite bathroom has an oval shaped bathtub with over shower, basin with large mirror, a toilet and a large walk-in wardrobe. The back master has a king-sized bed, a 21" TV with CD player, radio alarm clock and a ceiling fan. 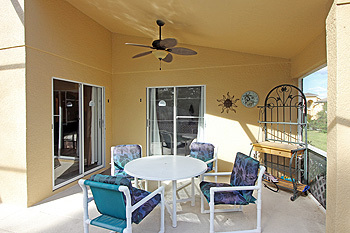 There are patio doors leading to the lanai and pool area. The en-suite bathroom has a walk-in shower, basin with large mirror, a toilet and a large walk-in wardrobe. 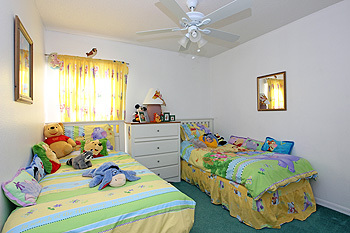 Both rooms have twin beds with ample storage space chests of drawers and wardrobe. They each have a TV/VCR that will also accept games. A PS2 and games are in the front twin. 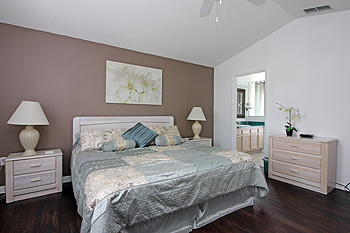 A third bathroom is situated between the two rooms and offers a bathtub with overhead shower, basin with overhead large Hollywood style mirror and a toilet. There is a pool table, a table football (foosball), air-hockey and electronic darts plus the all-essential portable music system plus a portable fan; Ideal for keeping those bored teenagers entertained! 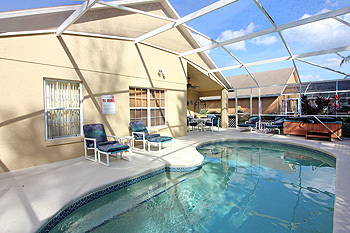 A south -facing pool and lanai ensure you get the best weather in winter as well as summer. We provide comfortable sun-loungers as well as chairs and foot -stools. The pool is 26'X13' with spray jets and gently shaped area with steps at the low end and a seating ledge at the deep end. The pool and lanai area can be illuminated for night swimming. There is a free-standing hot tub/spa with 13 jets where you can ease the aches and pains of a day at the park! 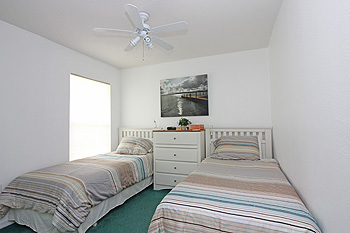 Our villa is licensed by the Florida Division of Hotels and Restaurants and is in full compliance with the state safety standards. There are smoke detectors, pool alarms on the patio doors, fire extinguisher and front lights. We operate a no-smoking policy in the villa.